Proceed to install the files. Place your SN and add two zeros "00" at the end , then wait for the email from ZUK. Check SPAM and other folders as required incase it does not hit your inbox. Notes: Flashing the bootloader wipes all userdata! BACKUP FIRSTLY!!!! 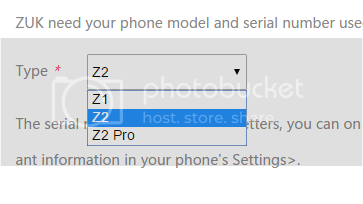 Is this guide for root z2? Anyone try? have you installed custom recovery (twrp)? cause my question is: do we get further updates while using a custom recovery? or do we still get them via OTA but can't install it cause of twrp? And do I even receive further updates while rooting / installing supersu? Have you try exposed framework? - Depends, let see, otherwise let's flash the .44 and update. But on my uni super I'm able to get ota... let see. No ,I'm not gonna try as it's zui. Is this reliable and working? If flash the stock rom, will the bootoloader be locked again? Ehm... I cannot finish the Process to get the Email. Stuck at the SMS part. how do i get the phone in right mode when i want to flash with qpst tool? I'm unable to register at developer.zuk.com, no matter what email I try (private, work, wife ...) I always get "Input error..."